Women in the United States have made significant strides toward closing the gaps that have kept them from achieving equality with men. But the country is sharply divided over how much work remains to be done, and those divisions are rooted mainly in the growing partisan schism that pervades American values and culture these days. A new Pew Research Center survey finds that Democrats are largely dissatisfied with the nation’s progress on this issue – 69% say the country hasn’t gone far enough when it comes to giving women equal rights with men. Among Republicans, more than half (54%) say things are about right, while only 26% say the country has more work to do. 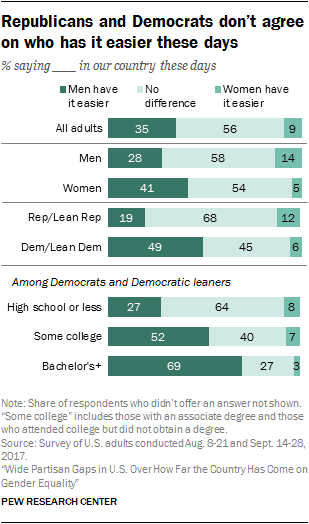 Democrats are also much more likely than Republicans to say that men have easier lives than women these days: 49% of Democrats say this compared with 19% of Republicans. A majority of Republicans (68%) say neither men nor women have it easier today (compared with 45% of Democrats). Those who see an advantage for men often say these inequities are rooted in the workplace. Politics also underpins views about who has benefited from the changing roles of men and women. Among Democrats and Republicans, more see an upside for women than for men as women have taken on a greater role in the workplace and men have assumed more responsibility for child care and housework, but Democrats are far more likely than Republicans to see benefits flowing from this societal shift. 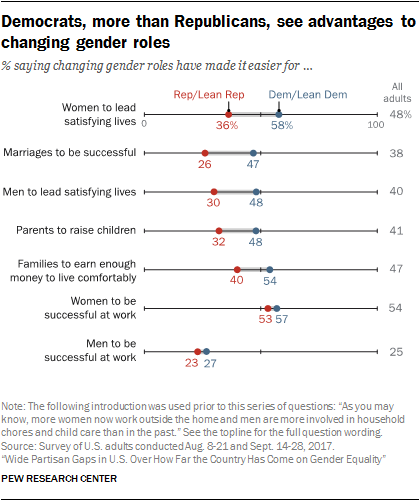 Roughly six-in-ten Democrats (58%) say that changing gender roles have made it easier for women to lead satisfying lives; about a third of Republicans (36%) say the same. And while about half of Democrats (48%) say these changes have made it easier for men to lead satisfying lives, only 30% of Republicans share this view. In addition, Democrats are more likely than Republicans to say changing gender roles have made it easier for parents to raise children, for marriages to be successful and for families to earn enough money to live comfortably. To be sure, men and women have different perspectives on how far the country has come in achieving gender equality, but these differences are relatively narrow when partisanship is considered. More than half of women (57%) say the country hasn’t done enough to give women equal rights with men, while 33% say things are about right. For their part, men are equally split between saying there is more work to be done (42%) and things are about right (44%). And women are much more likely than men to say that men have it easier these days (41% vs. 28%). Among Democrats, a majority of women (74%) and men (64%) say the country hasn’t gone far enough when it comes to achieving gender equality. And while Republican women are more likely than their male counterparts to share this view (33% vs. 20%), relatively small shares of each group do so. 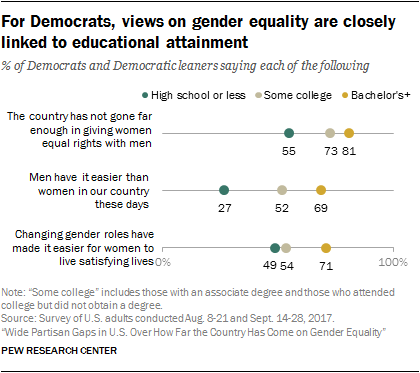 About eight-in-ten Democrats with a bachelor’s degree or higher (81%) and 73% of those with some college experience say the country has not gone far enough in giving women equal rights with men; 55% of those with a high school degree or less education say the same. Among Republicans, views are consistent across educational groups. The education gap among Democrats is even wider when it comes to whether men or women have easier lives these days. Among Democrats with a bachelor’s degree or higher, 69% say men have it easier. By comparison, 52% of Democrats with some college education and only 27% of those with a high school degree or less education say the same. Again, Republicans are more consistent in their views, regardless of educational attainment. Democrats are also divided in their assessments of how the changing roles of men and women have affected women’s lives. Roughly seven-in-ten Democrats with a four-year college degree (71%) say these changes have made it easier for women to live satisfying lives. Only about half of Democrats with some college experience (54%) or less education (49%) share that view. Republican views of the benefits of changing gender roles are also divided along educational lines. Those with a bachelor’s or higher degree are more likely than those with less education to say the changing roles of men and women have had a positive impact, particularly when it comes to women’s success at work: 62% of Republicans with at least a bachelor’s degree say these changes have made it easier for women to be successful at work, compared with 49% of those with less education. In spite of the gains women have made in the labor force in recent decades, today’s young women are no less likely than older generations to say the country has more work to do in bringing about gender equality. And Millennial women are significantly more likely than Generation X, Baby Boomer or Silent Generation women to say that men have it easier than women these days – roughly half (52%) of Millennial women say this compared with 37% or fewer among the older generations. The views of Millennial women differ sharply from those of Millennial men on the question of whether changing gender roles have made it easier for women to live more satisfying lives. While 61% of Millennial men say women have benefited from these changes, only 48% of Millennial women agree. 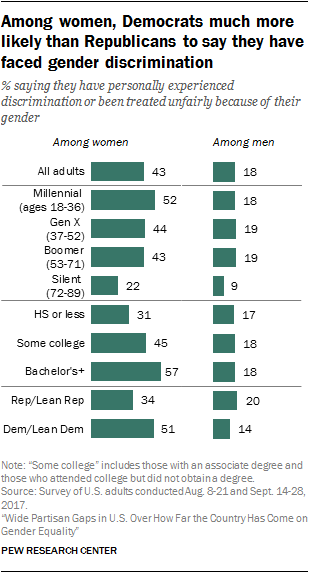 Among older generations of adults, there is no similar gender gap. Overall, about four-in-ten women (43%) say they have experienced discrimination or been treated unfairly because of their gender; far smaller shares of men (18%) say this has happened to them. Democratic women are significantly more likely than Republican women to say they have experienced gender discrimination (51% vs. 34%). Among men, it’s Republicans who more often say they have been discriminated against because of their gender (20% compared with 14% of Democratic men). Among women who say they have faced gender-based discrimination or unfair treatment, a solid majority (71%) say the country hasn’t gone far enough when it comes to giving women equal rights with men. About half (46%) of women who don’t share these experiences say the same. And while a relatively small share of the public says the country has gone too far when it comes to gender equality, men who say they have been discriminated against because of their gender are particularly likely to hold this view: 23% among this group say it has gone too far, compared with one-in-ten men who say they haven’t experienced gender discrimination. 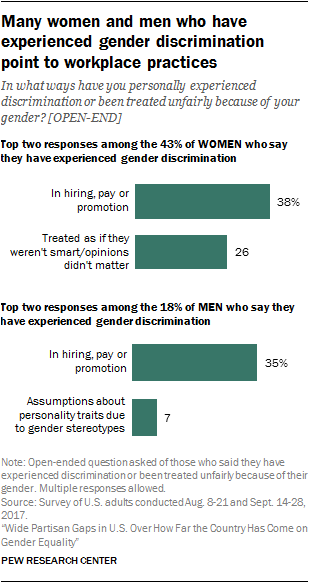 Among both women and men who say they have faced discrimination because of their gender, more cite situations related to hiring, pay or promotion than any other example of unfair treatment they have experienced. Among men who say they have faced gender discrimination, experiences related to the workplace are by far the most common. About a third of these men (35%) say they were discriminated against or treated unfairly in hiring, pay or promotion. By comparison, 7% say people made assumptions about their personality because of their gender, the second-most cited example among men who say they have experienced gender discrimination. In many ways, the workplace has represented the front lines in the battle for gender equality in the U.S. Over the past half century, the role of women in the workplace has been transformed as they have increased their labor force participation, seen their wages increase and made inroads into occupations that were previously dominated by men. Even so, women still lag behind in several key leadership realms. Today women make up 47% of the U.S. labor force – up from 30% in 1950. The share of women in the labor force grew throughout the second half of the 20th century, but has leveled off since then. Previous analysis by the Center indicates that in the coming decades women will continue to be slightly less than half of the labor force and that their share may even dip below the current 47%. This overall trend is linked to labor force participation, another area where women have seen tremendous growth over the past several decades – narrowing the gap with their male counterparts. In 2016, 57% of women (ages 16 and older) were either employed or looking for work. That share is higher than it was in 1980 (51%) but down somewhat from its peak of 60% in 1999. 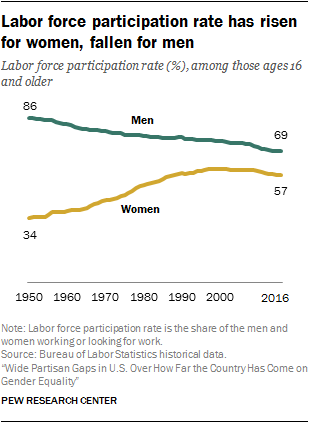 Over the period in which women’s labor force participation was increasing, men’s presence in the labor force was on the decline, and this trend among men has since continued. In 1980, 77% of men (ages 16 and older) were employed or looking for work; in 2016, 69% were in the labor force. The falloff in men’s labor force participation has been particularly sharp among men with no education beyond high school. As women have increased their presence in the labor force, they’ve seen their wages grow. At the same time, men’s wages have fallen. In 2016, women’s median hourly earnings were $16.00, up from $12.48 in 1980. Men earned a median hourly wage of $19.23 in 2016, down slightly from $19.42 in 1980. Wages have declined more sharply for young men (those ages 25 to 34) than for other age groups. 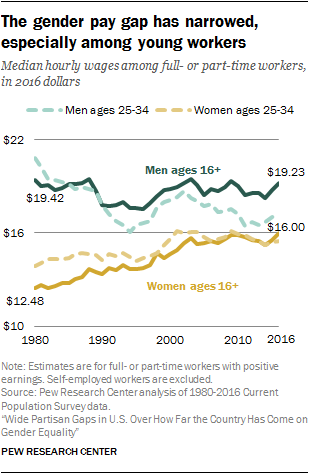 In 2016, young men earned, on average, $17.31 per hour, compared with $20.81 in 1980. Higher earnings for women and lower earnings for men have resulted in a narrower gender wage gap. In 2016, women earned, on average, 83 cents for every dollar earned by men. In 1980 women earned 64 cents for every dollar earned by men. Still, the gender wage gap persists, and the reasons for that are complex. Women’s earnings tend to decline roughly 10 years into their work lives as many face the challenges and trade-offs that come with balancing work and family life. There are also other factors that are difficult to quantify, such as gender discrimination, the persistence of gender stereotypes and women’s limited access to male-dominated professional networks. The gains women have made in wages have been driven in part by their increased presence in more lucrative occupations. Today, women are just as likely as men to be working in managerial occupations. In 1980, men were twice as likely as women to have these types of jobs. In the past, women were more highly concentrated in lower-paying clerical or administrative occupations than they are today. Even as women have made inroads in a wide range of leadership positions in recent decades, the gender gap remains quite wide in this area. Women made up roughly 5% of Fortune 500 CEOs in the first quarter of 2017 and about 20% of Fortune 500 board members in 2016. Only about 20% of members of Congress and about a quarter of members of state legislatures are women. Currently, there are six female governors and four females in executive branch Cabinet-level positions (not including those serving acting positions). Click here for a more detailed look at data on women leaders. Americans across demographic and partisan groups agree that women should have equal rights with men. About eight-in-ten Americans (82%) say it is very important for women to have equal rights with men in our country, and another 14% say this is somewhat important. Just 4% of Americans say gender equality is not too or not at all important. Asked whether the country has gone too far, not gone far enough or been about right when it comes to giving women equal rights with men, half of the public says the country still has work to do, while 39% say things are about where they should be; one-in-ten Americans believe the country has gone too far in giving women equal rights with men. These views differ by gender, education and, most of all, partisanship. About seven-in-ten Democrats or Democratic-leaning independents (69%) say the country hasn’t gone far enough when it comes to giving women equal rights with men, compared with 26% of Republicans and independents who lean Republican. In turn, just over half of Republicans (54%) – vs. 26% of Democrats – say things are about right and 18% say the country has gone too far in giving women equal rights with men (just 4% of Democrats say the country has gone too far). Among Democrats, those with at least some college education are far more likely than those with no college experience to express dissatisfaction with the current state of gender equality. About eight-in-ten Democrats with a bachelor’s degree or more education (81%) and roughly three-quarters of those with some college (73%) say the country hasn’t gone far enough when it comes to giving women equal rights with men. A far smaller share of Democrats with a high school diploma or less education (55%) share this view. There are no significant education gaps among Republicans in views of the state of gender equality. The survey also finds that men and women express considerably different views about the current state of gender equality, but this gender gap narrows when partisanship is taken into account. Overall, among women, far more say the country hasn’t gone far enough (57%) than say it has been about right (33%) when it comes to giving women equal rights. 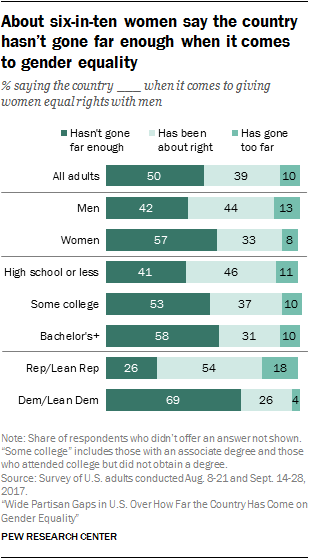 Men, however, are about evenly divided: 42% say the country hasn’t gone far enough and 44% say it’s been about right. Among Democrats, a somewhat higher share of women than men say the country has work to do to achieve gender equality, but majorities of both groups say this is the case (74% of Democratic women and 64% of Democratic men). And while Republican women are more likely than their male counterparts to say the country hasn’t gone far enough when it comes to giving women equal rights with men, relatively small shares in each group express this view (33% and 20%, respectively). About one-in-five Republican men (22%) and 14% of Republican women say the country has gone too far. 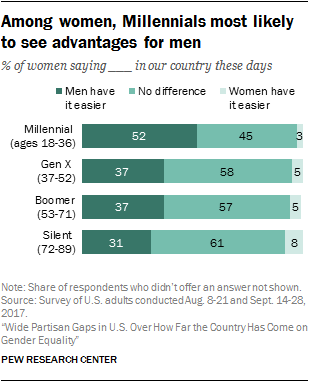 Far more Americans say men have it easier in our country these days than say things are easier for women (35% vs. 9%); still, a majority (56%) say there is no difference. 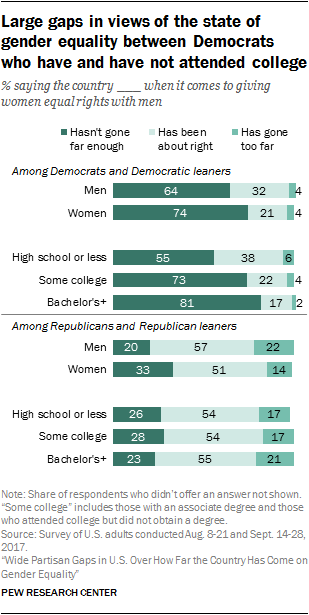 Perceptions vary considerably by gender, educational attainment and partisanship. Women are more likely than men to say men have it easier: 41% of women say this is the case, compared with about a quarter of men (28%). And while relatively few men or women say women have it easier, men are about three times as likely as women to offer this view (14% vs. 5%, respectively). Partisanship also plays a large role in perceptions of how things are going for men and women in the U.S. Among Democrats and Democratic-leaning independents, similar shares say men have it easier (49%) as say there is no difference (45%). In contrast, most Republicans and Republican-leaning independents (68%) say there is no difference, while 19% say men have it easier and 12% say women do. Adults with a bachelor’s degree or more education are far more likely than those with less education to see an advantage for men, but this educational gap is driven entirely by differences among Democrats. About seven-in-ten Democrats with at least a bachelor’s degree say men have it easier than women in our country these days, compared with about half of those with some college (52%) and about a quarter of those with a high school diploma or less education (27%). In contrast, among Republicans, views of who has it easier are consistent across levels of educational attainment. For the most part, men and women who say men have it easier offer similar explanations for their answer, but a larger share among women than among men cite differences in pay (47% vs. 37%). Still, the gender pay gap tops the list for both men and women who say things are easier for men in our country these days. Democrats who say men have it easier than women are far more likely than their Republican counterparts to cite higher wages when asked in what ways men have it easier: 46% of Democrats and Democratic-leaning independents say this, compared with 31% of Republicans and Republican-leaning independents. Democrats are also more likely than Republicans to volunteer that men have more political power than women (12% vs. 2%). Other answers are mentioned about equally by Democrats and Republicans who say men have it easier than women. In their own words: In what ways would you say MEN have it easier in our country these days? When those in the relatively small share of Americans who say that women have it easier in this country today are asked to elaborate on their answers, 30% point to more job opportunities or preferential treatment in employment as ways in which women have it easier – far more than offer any other example. In their own words: In what ways would you say WOMEN have it easier in our country these days? About four-in-ten women (43%) say they have personally experienced discrimination or been treated unfairly because of their gender; 18% of men say this has happened to them. Among women, those with more education are more likely to say they have experienced gender discrimination. About six-in-ten women with a bachelor’s degree or more education (57%) say this has happened to them, compared with 45% of those with some college and 31% of those with a high school diploma or less education. In contrast, among men, similar shares across educational levels say they have experienced discrimination or been treated unfairly because of their gender. Democratic women are far more likely than their Republican counterparts to report that they have experienced discrimination or been treated unfairly because of their gender. About half of women who identify with the Democratic Party or lean Democratic (51%) say this has happened to them, compared with 34% of Republican or Republican-leaning women. Among men, the opposite pattern emerges: Republican men are somewhat more likely than Democratic men to say they have experienced gender discrimination, although relatively small shares of both groups say this has happened to them (20% vs. 14%, respectively). Men who say they have faced discrimination or have been treated unfairly because of their gender are five times as likely to mention experiences related to hiring, pay or promotion (35%) as they are to say people have made assumptions about their personality because of their gender (7%), the second most cited example among men who say they have personally experienced gender discrimination. Since the 1970s, a greater share of women in two-parent families are working outside the home either full-time or part-time. At the same time, fathers report spending more time on child care and household chores. While there is some ambivalence among the public about the impact of these changing gender roles, more say these changes have made things easier for women than say they have made things easier for men. Just over half of the public (54%) says changing gender roles – in particular, the fact that more women are working outside the home and men are more involved in housework and child care – have made it easier for women to be successful at work. Far fewer (25%) say these changes have made it easier for men to be successful at work; 49% say they haven’t made much difference and 25% say they have made it harder for men to be successful at work. And while about half (48%) say these changing gender roles have made it easier for women to lead satisfying lives, fewer (40%) say they have made it easier for men to lead satisfying lives. When it comes to the impact of changing gender roles on family life, about half of Americans (47%) say these changes have made it easier for families to earn enough money to live comfortably; a quarter say they have made things harder and 27% say they haven’t made much difference. About four-in-ten (41%) say changing gender roles have made it easier for parents to raise children, but a third say these changes have made parenting harder. Similarly, while 38% say these changes have made it easier for marriages to be successful, 30% say they have made this harder. As with views about the state of gender equality, attitudes about the impact of changing gender roles on men, women and families vary sharply across party lines, with Democrats far more likely than Republicans to see benefits in many areas. For example, roughly six-in-ten Democrats (58%) say these changes have made it easier for women to lead satisfying lives; just 36% of Republicans share this view. Double-digit party gaps are also evident when it comes to views of whether changing gender roles have made it easier for marriages to be successful (a gap of 21 percentage points), for men to lead satisfying lives (18 points), for parents to raise children (16 points) and for families to earn enough money to live comfortably (14 points). 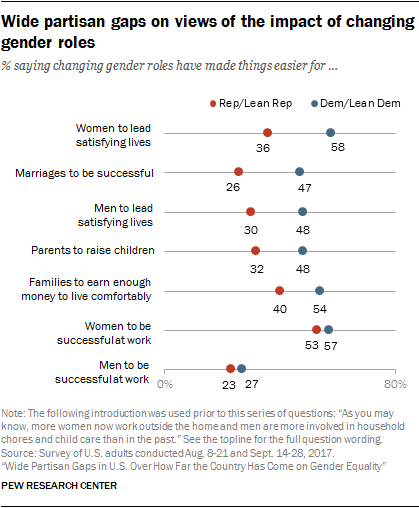 Democrats and Republicans offer similar views on the impact of changing gender roles on men’s and women’s ability to be successful at work. Attitudes about the impact of changing gender roles also vary sharply by education, and these differences mostly hold up among Democrats and Republicans alike. 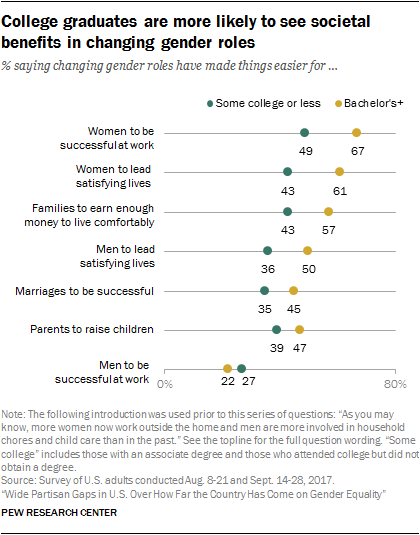 At least six-in-ten adults with a bachelor’s degree or more education say changing gender roles have made it easier for women to be successful at work (67%) and to lead satisfying lives (61%); about half or fewer of those with some college or less education say this is the case (49% say these changes have made it easier for women to succeed at work and 43% say the same about women leading satisfying lives). Similarly, by double-digit margins, college graduates are more likely than adults with less education to say changing gender roles have made it easier for families to earn enough money to live comfortably (a gap of 14 percentage points), for men to lead satisfying lives (14 points) and for marriages to be successful (10 points). For the most part, men and women offer similar views of the impact of changing gender roles on society, but there are striking gender differences among parents of children younger than 18 when it comes to the impact of these changes on raising children: 45% of mothers say they have made it easier for parents to raise children, compared with 29% of fathers. And while similar shares of married and unmarried adults say changing gender roles have made it easier for marriages to be successful, there are gender differences among married women and men who say this is the case. About four-in-ten married women (42%) say changing gender roles have made it easier for marriages to be successful, compared with three-in-ten married men. CORRECTION (October 2017): An earlier version of this report stated that the differences in views of Millennial women compared to older women when it comes to who has it easier in our country these days were due, in part, to the political leanings of younger women. In fact, the generational differences on this question are particularly pronounced among Democratic women, suggesting that the overall generational gap is not driven by the fact that Millennial women are more Democratic than older generations of women. All references to party affiliation include those who lean toward that party: Republicans include those who identify as Republicans and independents who say they lean toward the Republican Party and Democrats include those who identify as Democrats and independents who say they lean toward the Democratic Party. References to Millennials include adults who are ages 18 to 36 in 2017. Generation Xers includes those who are ages 37 to 52, Baby Boomers include those who are 53 to 71 and Silents include those ages 72 to 89. References to college graduates or people with a college degree comprise those with a bachelor’s degree or more. “Some college” includes those with an associate degree and those who attended college but did not obtain a degree. “High school” refers to those who have a high school diploma or its equivalent, such as a General Education Development (GED) certificate.